The "do-nothing Congress" in Washington has been a problem for so long it's almost a cliché. But despite the criticism, Congress seems to get less productive every year. 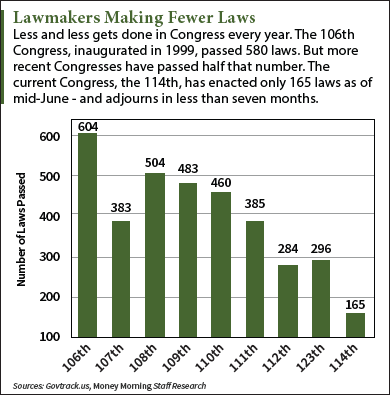 The current do-nothing Congress, the 114th, has enacted just 165 laws so far. At this pace, when the 114th Congress wraps up at the end of this year, it will have passed only 220 laws. That will be good enough to break the bleak record of 284 laws passed by the 112th Congress (2011-2013). It wasn't that long ago that Congress was passing laws at twice that rate. As recently as the 110th Congress (2007-2009), 460 laws were enacted. Back in the 1950s, a typical Congress would pass 800 to 1,000 laws in its two years of activity. So what's wrong with Congress? Usually "gridlock" between the Democrats and Republicans is blamed for our do-nothing Congress. For sure, the endless bickering and stubborn refusal to compromise is part the problem. You see, the main reason lawmakers get less done with each passing election cycle is that they simply don't have the time. That's right. The members of our do-nothing Congress fill their schedules with activities that keep them away from the $174,000-a-year jobs they were elected to do. Could it be that they're spending all that time assisting constituents? Nope. Are they having meetings with advocacy groups to learn more about issues vital to their district? Nope. Shockingly, our elected representatives spend most of their time engaged in activities of no benefit at all to the people they represent. For the most part, it benefits only themselves and their party, be they Democrat or Republican. The central duty of a U.S. congressman no longer is to make laws, as it was for the first 200-plus years of the republic. Now, the overriding priority for every member, from the freshman representatives to the most senior senators, is to raise money. Lots of money. They not only need to raise money for their own re-election, but for their affiliated party. Each member is required to pay thousands of dollars in fundraising "dues" their party. Freshly elected representatives get quite a shock when they arrive in Washington. On Day One, a party representative delivers the news. "Your job, new member of Congress, is to raise $18,000 a day. Your first responsibility is to make sure you hit $18,000 a day," Rep. David Jolley (R-FL) told CBS News' "60 Minutes," relating what happened to him in 2014. Congress members need to devote much of their daily schedule – at least 25%, often half, and sometimes as much as two-thirds – to fundraising. Back in 2013, the Huffington Post obtained a PowerPoint slide made by the Democratic Congressional Campaign Committee (DCCC). 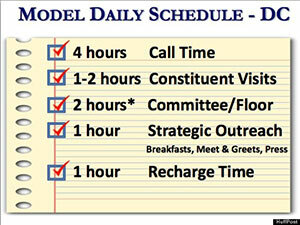 It contained a "model daily schedule" for an incoming Congress member. Only two hours are set aside for doing the actual work of Congress. Twice as much time – four hours – is supposed to be devoted to making fundraising phone calls. And the two or three hours suggested for "constituent visits" and "strategic outreach" typically morph into in-person fundraising opportunities. Members despise the time drain of fundraising, but feel compelled to do it out of fear of not being re-elected. Plus, the party chieftains do plenty of arm-twisting. And as the cost of financing a campaign has risen, lawmakers have devoted more time to fundraising – and less to lawmaking. According to OpenSecrets.org, the average amount of money spent on a congressional race in 1998 was about $3 million. By the 2014 cycle, the average had climbed to $7.1 million. 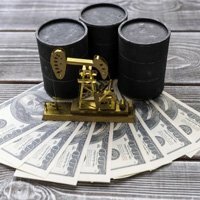 Making matters worse was the impact of the 2010 Supreme Court Citizens United decision. It allowed the creation of super PACs (political action committees) that could raise and spend virtually unlimited amounts of money. As late as 2008, the average cost of a congressional campaign was $4.64 million. That was when both parties began urging members to spend 30 hours a week on fundraising calls. Both the DCCC and its GOP counterpart, the National Republican Congressional Committee (NRCC), have set up call centers near the U.S. Capitol building. That's because it's illegal for members of Congress to make fundraising calls from their offices. The call centers would be familiar to any telemarketer: ugly rows of cubicles in a depressing room. Each congressman has a "call book" of potential donors. They sit at the desk with an assistant, who dials the target and gets them on the phone. At that point, the Congress member does their best to pry $500, $1,000, or more out of the donor. Then (sometimes with prodding from the assistant, who is there to police brevity) it's on to the next call. But laboring as an overpaid telemarketer isn't the only fundraising task eating the lawmaker's time. There are fundraisers to attend. Retiring Rep. Steve Israel (D-NY) estimates he's attended more than 1,600 fundraisers over his 16 years in office. And they're not always dinners. Fundraising breakfasts and lunches are just as common. Between the fundraisers and the call centers, congressmen can spend virtually an entire day begging for cash. Worst of all, the emphasis on fundraising ensures lawmakers will be dangerously unprepared when they do show up for work. "Any member who follows that schedule will be completely controlled by their staff, handed statements that their staff prepared, speaking from talking points they get emailed from leadership," retired Rep. Brad Miller (D-NC) told the Huffington Post in 2013. "You won't ask tough questions in hearings that might displease potential contributors, won't support amendments that might anger them, will tend to vote the way contributors want you to vote." Maybe we are LUCKY, there are to many laws now and it seems whatever congress 'touches' is a disaster. Felix is right. The measurement of a successful Congress is not the number of bills passed but what issues have been resolved. How long have we been aware of the pending social security and medicare explosions, the VA management problems still exist despite headlines. Members' priorities are raising money and re-election. I agree with Felix and say be more selective in the bills to attend to and reform. Please tackle the real problems we are facing that really count and cancel pet projects and bill add-ons. Seems to me that the fewer laws they pass, the better. Every time Congress gets involved with anything, they seem to foul things up. Oh yes, and in order to pass laws, guess who has to sign them into law? Yeah, that's right. BHO himself. I would like to see Congress take a break and not pass any legislation for BHO to sign into law. That would be better than the alternative. if all they are doing is trying to pilfer more money from the people, who are already taxed to death, why do we even need them ? even when the pass a bill they sneak so much into unknown personal projects, we have no idea where our money is going. No wonder the work of Congress as so small and usually missing the point. Something must be done to rectify the situation but who and how can this be accomplished? Not only Congress is at fault, just look at the actions of the FBI and the Supreme Court Justice during the past week!!! Total lunacy…They should be limited to 6 months in session and paid $600 a month like here in Texas!